Marketing itself as one of Africa’s most exclusive safari destinations, Botswana is an extraordinary place. This is the land of the Big Five – a critically important stronghold of lions, home to Africa’s largest elephant herds, blessed with plentiful leopard and buffalo, and although the rhino remains the weak link, it is making a tentative comeback. This is also one of the last places on earth where the charismatic African wild dog still roams free in numbers. In short, Botswana is the sort of place where even your average safari feels like stepping into a documentary by National Geographic, one where so many of the great dramas of the African wild are played out on a daily basis. The wildlife spectacles here may be exceptional, but this is one country where the landscapes are every bit as spectacular. The Okavango Delta is one of Africa’s true epics, an ever-changing, elemental world of watery expanses and islands whose boundaries change with the seasons. The delta is the starting point for a string of iconic landscapes and safari destinations – Moremi, Savuti and Chobe to name just three – across the country’s north. Just beyond the reach of the Delta’s waters, the hallucinatory salt pans of Makgadikgadi, and Kalahari sands extend towards an endless horizon. I love following the barely discernible trails that snake through the delta, tracking the lions of Savuti, or drawing near to the great elephant herds of Chobe. But what I really love about Botswana is the chance to disappear into the Kalahari when the crowds of safari vehicles become too much. With its vast ancient river valleys and black-maned lions, the Kalahari is a soulful place, another elemental landscape that serves as a reminder that Botswana is one of the last great wilderness destinations on the continent. As I have a passion for responsible, sustainable wilderness experiences in beautiful natural surroundings, I find Botswana very hard to fault. It’s the quintessential safari destination, home to numerous lodges, tour companies and individuals who are wholeheartedly committed to caring for the environment and conserving wildlife. No other African country has such a rich mosaic of pristine habitats, from russet-coloured dunes to glittering seasonal wetlands. Much is desert – the semi-arid Kalahari covers over eighty percent of the country. But when distant rainfall floods the sandy basins and salt pans, enormous numbers of animals arrive, including the iconic Big Five – lions, leopards, elephants, buffalos and rhinos – and rarities such as red lechwes, pukus, sitatungas and wild dogs. The north, which receives far more water than the south, is home to Botswana’s prime safari destinations. The two blockbusters, Chobe National Park and the Okavango Delta, are unmissable, but the quieter private reserves which lie between them are equally superb in their own way. While it’s perfectly possible to explore independently, most visitors opt for an organised safari. Just about every variation is available, including camping, walking, self-driving, horseriding, elephant-back. A national policy which favours high-spending, low-impact tourism over mass-market alternatives means that prices tend to be high, but standards are too, and in my view Botswana’s best lodges, camps and guides rank among Africa’s very finest. Botswana has perhaps a more single-minded focus on safaris than does any other African destination. After all, the country is so empty that there is little else to tempt the visitor. It is dominated by two very different landscapes: to the south and west lies the Kalahari, a remote, savanna semi-desert where wildlife is specialised and game seasonal; to the northwest is the Okavango Delta, an ever-changing labyrinth of islands and waterways that hosts one of the planet’s greatest wildlife spectacles, with both a wealth of aquatic species and vast herds migrating to and from its seasonal bounty. A typical Botswana safari combines Chobe National Park, to the north, with Moremi and the Okavango Delta. I have done this overland as part of a low-budget package: the terrain was grueling and the camping truly wild, but the wildlife experience second-to-none. If your budget allows, however, there are any number of swanky lodges that you can visit on an upmarket safari. Either way, a late dry season trip will mean prolific game, including Africa’s greatest elephant population, plus excellent predator encounters – with wild dog perhaps easier to see here than anywhere else in Africa. Private concessions around the Okavango, and towards the Linyanti and Selinda regions in the north, boast some of Africa’s most exclusive safari experiences. More for purists, perhaps is the Kalahari, where big game is not guaranteed in such numbers, but unusual wildlife and wall-to-wall wilderness are the order of the day. The outlying salt pans, such as Makgadikgadi and Nxai Pan, are fascinating destinations, with additional attractions such as breeding flamingos and stone-age remains. Botswana enthusiasts all have their favourite haunt. For some it’s the Savuti channel, in southern Chobe, where I’ve had elephants around my tent by day and hyenas by night. For others it’s the Boteti riverfront or Baines baobabs. Such names have safari aficionados salivating with thoughts of wilderness and adventure. One word of warning, though: if you try to explore the country on a limited budget and in an inadequate vehicle you’ll find it’s an easy place to get stuck. And with rainfall – or the lack of it – a critical factor in all locations, visiting the right place at the wrong time can be a disappointment. So plan your trip wisely. Chobe is the elephant heartland of Africa and nowhere on the continent will you find these pachyderms in the same jaw-dropping concentrations as the Chobe region of northern Botswana. Nearby the Savute channel is renowned for its lions in much the same way as Makgadikgadi and Naxi Pans are famous for their mesmerising saltpans. Further south, the Kalahari Desert predominates and the rolling dunes of the Kgalagadi Transfrontier Park, the sprawling sands of the Central Kalahari Game Reserve, and diminutive Khutse offer off-the-beaten-track safari options to those who love big skies, wide-open space and arid, untrammelled wilderness with a surprising amount of wildlife surviving in these waterless lands. For me, the re-energising feeling that the wide-open spaces of this remote desert wilderness exude more than compensates for the high temperatures and logistical challenges of the Kalahari. Botswana has made a conscious decision that it wants its safari scene to be all about quality rather than quantity. Low numbers of high-paying tourists generate revenue and jobs without corrupting or taming its natural integrity. This far-sighted approach to wildlife tourism development has produced a country today that has it all: incredible wildlife-viewing, mesmerising scenic beauty and a wilderness vibe second to none. Botswana is, to my mind, southern Africa's most epic safari destination. Compared with many parks in neighbouring South Africa, Botswanan reserves such as Moremi take you deeper into the bush, meaning you spend longer in the animals' territory and see more of their interactions. You leave tarred roads far behind and, whether you’re on a luxury safari or a cheaper expedition, have a full-on experience of the African bush. The drawback is that going on safari in Botswana doesn't come cheap. Indeed, it's part of the government's conservation plan to keep Botswana's parks and reserves fairly exclusive, thus limiting visitor numbers. Self-drive safaris are possible, if you have a 4WD with all the gadgets and experience of scrambling through the bush. For most people, however, an organised safari is the easiest route. Options range from group 'mobile safaris', on which you move around camping in different spots, to expeditions from five-star lodges. When I visited, I hired a car in Maun and drove to Planet Baobab for forays into the salt pans, and then returned to Maun for a one-week trip across Moremi and Chobe, run by Bush Ways Safaris. The itinerary worked nicely, mixing independent travel with a guided trip. It's worth booking Botswanan safaris well in advance. Not just because of their popularity, but because you have to approach them in the opposite way to most holidays: book the safari first, then organise accommodation, flights and transfers around it (most safari operators can help with everything). For my trip in September 2012, I started making bookings the previous February, and some lodges and activities were already booked up. The expense and organisation are well worth it though. For awesome animal encounters, classic African landscapes and experiencing the heart of the bush, Botswana is right up there with the Serengeti. In a troubled world there is nowhere safer than this most politically stable of African countries. The people are welcoming. English is widely spoken and when it comes to wildlife viewing Botswana is sensational. That’s because its policy of eschewing the mass market in favour of high-end, low impact safari camps has created a hugely successful tourist industry without spoiling the wild places that visitors come to see. Go to the Okavango Delta and you’ll see what I mean. 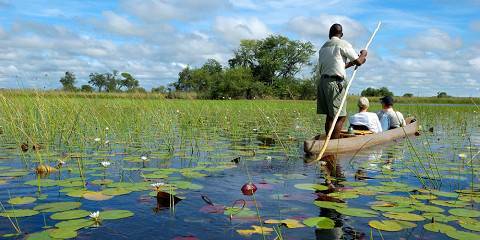 This miraculous oasis of palm trees, water lilies, open floodplains and crystal channels has been largely sub-divided into safari concessions that give visitors the illusion of having checked into their own exclusive wilderness to be explored by 4WD or mekoro – the Delta’s traditional dugout canoes. Here you’ll be living in the heart of big cat country and the same goes for Chobe National Park next door, where you’ll also see more elephants than anywhere else on earth. Why? Because only Botswana - a country bigger than France but with a population of fewer than two million people - has enough space for the herds to roam at will. Botswana’s other big must-see attraction is the Kalahari – best experienced on a safari to the Central Kalahari Game Reserve, Nxai Pan National Park and Jack’s Camp on the edge of the Makgadikgadi Salt Pans. Desert it may be, but come in March towards the end of the rainy season and you will find these vast thirstlands transformed and filled with all kinds of spectacular wild creatures, including black-maned Kalahari lions and flamingos by the million. The closest I have ever come to agoraphobia was the first time I went to Botswana, when I spent a week bouncing from game lodge to game lodge by small plane every day flying across vast expanses of pancake-flat, utterly uninhabited bush, with barely even a dirt track across it. I had never seen anything so big and so empty. The little bush camps seemed so incredibly fragile and remote. By African standards, Botswana is quite a small country but that still leaves a lot of space and the vast majority of the country’s 2 million people live on the western fringe of the country. Over 70% of the country is Kalahari Desert and virtually uninhabitable. That leaves a huge amount of room for wildlife, which Botswana has in bucketloads. The Okavango River makes a valiant effort to snake its way across the sands but eventually gives up and fans out into a vast inland delta that has become one of the greatest wildlife sanctuaries in the world. The surrounding desert might seem inhospitable but a surprising amount of life from San nomads to desert lions have adapted to the harsh environment, best experienced in the Central Kalahari National Park, in the vast white Makgadikgadi Pans, a salt pan the size of Portugal and the Kgalagadi Transfrontier Park on the South African border. Up in the north, the Chobe National Park is probably the greenest in the country, crossed by the Chobe, Linyate and Savute Rivers and backing onto Zimbabwe’s great Hwange and Zambezi National Parks allowing the vast herds of elephants to roam freely across the borders. With the exception of those in the far north, most safaris in Botswana are fly-in and high-end, with some of Africa’s most luxurious small lodges on offer. This isn’t a cheap option but the wildlife in the unfenced camps is exciting. And as long as you are happy with anthills instead of mountains, the delta scenery, with its reedy canals and water-lilly lagoons is serenely beautiful. Botswana is the first class airline cabin of the African safari scene. Expensive (for the most part), exclusive - and absolutely worth it. The Okavango Delta is one of the world’s most spectacular wild places, and a bucket list destination for any dedicated safari enthusiast. The camps and lodges here are for the most part superb, but it’s also worth considering a mobile safari (these come in varying degrees of luxury) which provide the chance to really immerse yourself in the bush. Boat travel is a massive part of safari-ing in Botswana, but if you don’t want a numb bottom I suggest limiting your experience of mokoro (traditional dugout canoe) travel to a few hours, and using more comfortable motorboats for longer stretches. If you can afford it, a trip over the Delta by light plane provides a stunning perspective of the true extend of this vast natural area. The Delta is the focus of most visits to Botswana, but I also loved the country’s salt pans – vast, eerie white landscapes punctuated by startling rock formations. If you have some extra time on your itinerary, I highly recommend heading out into this shimmering inland sea on a quad bike – unforgettable. Botswana is pretty much one huge desert. With a tiny population of less than 2 million, most of the country is wild and untouched. As opposed to most the other safari countries covered here, I’ve only visited Botswana once. I flew around from park to park and was blown away by the emptiness of this magnificent country. Parks are mostly unfenced, and this is a country where you might get a feeling how Africa was before the population growth and habitat encroachment of the last century. The highlight of my trip was the magnificent Okavango Delta. This permanent water source is a magnet for animals, which can be spotted most easily on a classic game drive. The best game viewing is in Moremi Game Reserve. Personally, I was less worried about seeing big game than about absorbing the atmosphere of the place. I loved gliding silently through the delta by ‘mokoro’ dugout canoes. The water birds are phenomenal and the feeling of being absorbed into this massive eco-system was unique. One of my favourite places in Africa is Tuli Block. As opposed to most of the parks in Botswana, this one is quite accessible coming from South Africa. Mashatu Game Reserve is the biggest private game reserve in Southern Africa and it combines the perks of being in a privately-run park – for instance, excellent guides and off-road driving - with the real sense of wilderness that comes with being part of a vast unfenced eco-system. This vast, dry and thinly populated republic – supporting the equivalent of half the population of Madrid in an area larger than Spain – is one of Africa’s few unambiguous economic success stories, thanks largely to the immense mineral wealth that lies beneath its sandy Kalahari soils. Botswana is also an exceptional safari destination, having embarked on a pioneering brand of high-cost, low-impact ecotourism back in the 1990s. Although this policy has made it unpopular with budget travellers, it does ensure that those who make it to Botswana can enjoy a genuine wilderness experience. The country’s most important attraction is the Okavango Swamp, a vast and lushly vegetated inland delta formed by the Kavango River as it dissipates into the desert sands. The delta doesn’t quite match some other classic African reserves in terms of big game – though it does support decent populations of lion, elephant, buffalo and various antelope – but there’s a rich sense of uninterrupted space and tranquillity associated with exploring the labyrinthine waterways in a ‘mokoro’ dugout canoe, and the birdlife is tremendous. Good to visit in combination with Okavango is Chobe National Park, which lies in the far north, along the Zambezi, and hosts some of the most impressive elephant numbers in Africa. Desert and Delta diversity...and leopards galore! If – as many will feel – leopard sightings are your last great Big 5 aim, then Botswana is leopard country par excellence! I have made 5 visits to Botswana and, by some bizarre coincidence, have seen 6 leopards every time I have been there! Vast elephant herds are another frequent highlight of Botswana (Chobe and Tuli Block are particularly famed for this). I saw a herd of a hundred elephants in Tuli but rangers still speak of vast herds up to 400 strong! The Kalahari ranks for me as what might be Africa’s greatest and wildest safari location – you can travel for several days across the pans there without seeing a single other vehicle. The wetland wilderness of the Okavango makes for the perfect counterpoint to a long trip in the Kalahari. First a confession. I love Kenya. It’s by far and away my favourite African country and I refuse to accept that there might be an even better African safari destination. But then I went to Botswana and nothing could wipe the smile off my face. I’d long heard stories of what a wonderful wildlife destination Botswana was, but to be honest I thought it was all probably a bit overhyped. How wrong I was. Northern Botswana is said to have one of the largest, densest populations of elephants in Africa and I think I can honestly say that after my first few days in Botswana I’d probably seen more elephants, and often up alarmingly close, than I had in the previous two and a bit decades of African travel. Yes, it’s that’s good. As remarkable as the elephants and other wildlife is (although for big cats I’d say that most of Botswana falls far short of the Serengeti and Masai Mara) my most abiding memories of the country are of the myriad, confused waterways of the Okavango Delta at sundown. Quite simply the best sunsets I have ever seen and drifting lazily over the placid waters in a mokoro (wooden kayak for you and I) is one of the great experiences of Africa. Botswana is a country with a split personality. On the one hand it’s lush, water-logged and ripe with life in and around the Okavango delta and surrounding regions of the north. And with the wealth of the wildlife, some of the stand out lodges and safari operators in Africa and outrageously picturesque scenery it’s hardly a surprise that most people focus their efforts on this region. But, this is only a fraction of Botswana. Most of the country is a hot, harsh, parched part of the Kalahari desert. Not as immediately obvious as the greener north, places like the Central Kalahari Game Reserve or the zebra-filled Makgadikgadi Pans National Park offer a startling contrast to the delta and, in the case of the Central Kalahari Game Reserve and environs in particular the opportunity to break the wildlife watching with some cultural interactions with the San Bushmen. Botswana is a very safe, stable and prosperous African country with a safari infrastructure that’s second to none but yet it rarely feels crowded. One of the reasons for this is that Botswana has actively chased a high-end, exclusive safari clientele and while this helps to make it arguably the best safari destination in the world it also means that a safari here is often far from cheap (unless you drive yourself and bush camp although even then many areas will remain out of reach to you), but if you can afford it then I cannot recommend a Botswanan safari highly enough. Botswana’s substantial safari appeal is largely founded on the following simple formula: an extreme abundance of dramatic landscapes and wildlife (including all of the Big 5), and a comparative dearth of people. The human population of this peaceful and stable African success story numbers a mere 2 million in an area of land roughly the size of France (which has a population of over 65 million). The elephant population, however, is the largest in Africa, with more than 50,000 to be found in Chobe National Park alone. Driving through the country late last year, we regularly saw elephants crossing the main road, and also had to stop for a buffalo herd at least 500 strong. Seeing another vehicle was a much rarer experience. Botswana is also a relatively wealthy country and roads and infrastructure are generally good, which means self-drivers can get the sense of remote Africa without having to brave some of the potholes (both literal and metaphorical) that you might find in neighbouring countries such as Zimbabwe or Zambia. The wildlife and birdlife meccas of the Okavango Delta and the Chobe River defy their inhospitable surroundings and are certainly among the must-sees, though they can get busy. Lesser-frequented gems include Nxai Pan National Park and Central Kalahari Game Reserve. For the more intrepid, the latter is best experienced on a mobile camping safari. Botswana is completely hunting-free and a leading light in African eco-tourism – most lodges and camps found across the country also play their part in carrying this torch. Despite living across the border in South Africa and criss-crossing the African continent for both work and pleasure for many years, Botswana had somehow managed to elude me. Last year Botswana finally beckoned and it did not disappoint. If ever there was a country that encapsulated the rawness of nature, Botswana is it. It is home to some of the wildest and most remote big game safari destinations in Africa, such as the Okavango Delta, Moremi Game Reserve and Chobe National Park. Lions, leopards, buffalo, wildebeest, zebra, giraffe and elephants – lots and lots of elephants – they’re all here. In fact, with the country supporting the highest concentration of elephants on the African continent, you don’t even need to enter a game park to have a close encounter. We spied a number of elephants plodding along in the scrubland lining the main highway, as well as along the riverbanks near the edge of Kasane. Botswana’s landscape too is equally impressive spanning from the shimmering salt pans of Makgadikgadi to the sandy savannahs of the Kalahari to wondrous wetlands of the Delta. In spite of Botswana’s reputation as one of the most expensive safari destinations, with the government having long ago embarked on a policy of low-impact, high-value tourism, as we discovered, it is possible to see the best of the country on a modest budget. You simply need to forgo the luxury fly-in safaris with their posh lodges and comfy beds for an open 4WD, tent and a sleeping bag. There really is nothing more exhilarating than trying to fall asleep to lions roaring in the distance knowing that only a thin canvas wall separates you from the wildlife roaming outside. We chose a seven day, full participation tour which departed from Kasane. Be sure to bring your sense of adventure though, because you’ll be in for a long, hot and dusty ride! Botswana tends to fly under the radar in southern Africa in many ways. But it shouldn’t. This politically stable country is one of Africa’s success stories with admirable conservation policies, a growing economy, wildlife to enthrall visitors and an excellent hospitality industry. It’s a land of great contrasts from the dry, searingly hot Kalahari Desert to the wonders of the water-soaked Okavango Delta. The Kalahari and Makgadikgadi Pans offer desert-adapted animals such as the tiny, nimble steenbok, the stately oryx (gemsbok) with their dead-straight horns, giraffe, enormous kudu and impala. But most impressive of all are the black-maned Kalahari lions. At night the roar of these magnificent beasts reverberates around the Kalahari sands. It’s a sound that once heard is unlikely to be forgotten. Primeval, fearsome, raw power sends tingles down the spine. 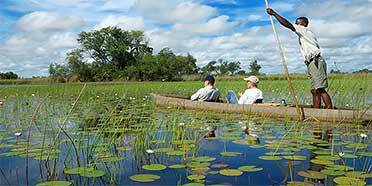 In the north of the country is the Okavango Delta, truly one of Africa’s great wonders, fed by the Okavango River and dependent on the rains in the Angolan highlands each year. It’s a series of waterways which supports large vegetated areas and an even greater number of animals. Elephants are here in huge numbers, cats such as lions, leopard and even cheetah can be seen. There are buffalo herds several hundred strong and water-loving antelope such as red lechwe, waterbuck and the rare sitatunga. Other commonly seen animals include giraffe, impala, wildebeest, zebra, hippo and hyena. Rhino are not as common but wild dogs have made a comeback and sightings are quite possible. Botswana, however, is not cheap – it has positioned itself very much at the top end of luxury tourism. Self-drive is possible, and there are some public parks and reserves with campsites, but you need experience driving on the sandy roads, many of which become impossible during the Wet season when they turn into churning mud, slippery and difficult to negotiate. Although the price tag of a safari in Botswana can be a drawback, the admirable conservation programs set a benchmark for other safari countries. And there’s something pretty special experiencing such a high degree of luxury in the bush. It’s popular with older safari tourists as well as families. You’ll need a strong stomach for the light aircraft flights which drop you between bush airstrips close to the various lodges. The aviation industry is safe and well run in Botswana but the flights can get bumpy! If I had 48 hours left on this planet, I would spend it on safari in Botswana. Botswana is my favourite African country. It still feels so wild, there is abundant wildlife, a huge variety of scenery and habitat…and only 2 million, very friendly, people. 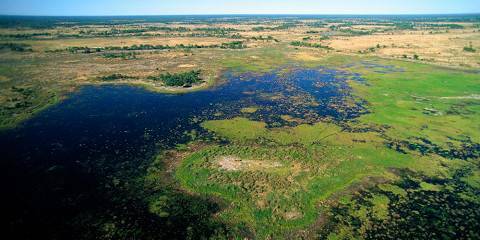 The jewel in Botswana’s crown is the Okavango Delta. 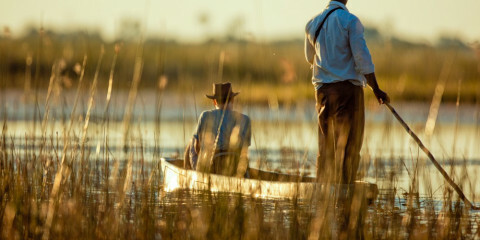 Whatever you do, take at least one mokoro (dug-out canoe) trip. It is just magical, gliding silently through the water, at eye level with the reed frogs and lechwe antelopes, and elephants sploshing past. A huge contrast to being in a vehicle. Adjoining the Delta is a mosaic of interlinked game reserves, private concessions and wildlife areas – Moremi, Khwai, Linyanti, Savuti and Chobe. These are all wonderful safari destinations in themselves and with great reputations for predator sightings. As well as these classic safari destinations, there are the vast, empty wilderness areas of the Makgadikgadi Salt Pans, Nxai Pan and the Central Kalahari Game Reserve. These make a very interesting alternative or add-on safari destination – if you go at the right time of year. You do not get the abundance of wildlife here, but a chance to see some of the more unusual species and desert specialists such as meerkat and brown hyena. And tucked away in the far corners of Botswana are Mashatu Game Reserve in the east, and the Kalahari Transfrontier Park in the south west – both offering yet more variations on the safari experience. Botswana has a reputation for being very high end, with the government’s “high value, low impact” approach to tourism. Mobile camping safaris can be a cheaper alternative and travelling outside of peak season can make a big difference. But there is a reason that many of the lodges in Botswana’s top safari destinations are booked up a year in advance….just go!